The European Union’s chief negotiator has warned that there can be no undermining of the single market. 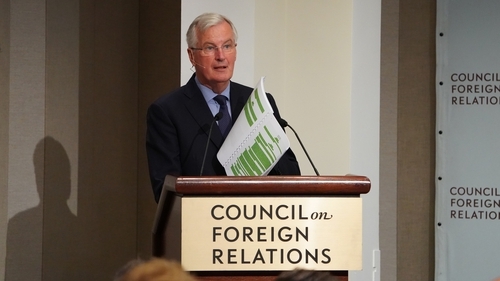 Speaking to the US Council on Foreign Relations in New York, Michel Barnier appeared to send a clear signal to the British government that the EU would not compromise on the four freedoms of the single market. He also said that both sides would have to find a compromise on the Irish border. The warning comes as British Prime Minister Theresa May continues to seek support from a divided party for her Chequers statement, which speaks of separating the four freedoms by splitting services and goods. The Chequers paper, which has prompted the resignations of Boris Johnson and David Davis, forms the basis of a forthcoming white paper on the future EU-UK relationship. Mr Barnier told an audience in New York: "Everybody will understand that we will protect the single market which is based on the indivisibility of what we call the four freedoms, of movement, for people, goods, services and capital." He said: "The British government has always had a very high degree of influence in building the single market. They know the rules. They know the indivisibility of the four freedoms." Mr Barnier said the UK did not want to recognise the European Court of Justice, free movement of people, they did not want to pay for access to the single market. Nor did the UK want to be part of the EU’s regulatory framework or trade policy. "These are their red lines, not our red lines," he said. Mr Barnier added: "The security and the stability of the European continent requires a close, close partnership with the UK – within NATO, bilaterally between the UK and member states, and also between the EU and UK. "Unfortunately this partnership cannot amount to membership.Membership matters. Outside the EU you cannot have the same rights and benefits as inside. "For example, being part of the single market is reserved for those respecting its rules. "The single market is a dynamic ecosystem based on common standards, common rules, common laws, common supervision, common regulation, and on top of this, common jurisdiction." Speaking to Richard Haass, the head of the CFR and a former US Envoy to Northern Ireland, Mr Barnier said: "No-one has ever shown to me the added value of Brexit. The clearest example is Ireland, where Brexit risks causing a major setback." He added that both sides had agreed 80% of the Withdrawal Agreement, but that the issue of the Irish backstop was still outstanding. He described a no deal scenario as "the worst solution for everybody". Mr Barnier said: "It will be a huge economic problem for the UK, and also for the EU. I’m not working for a bad deal, I’m working for a deal." On the Irish backstop, Mr Barnier said: "We must find a compromise. To be clear, if we want an agreement on the Withdrawal Agreement in October, November … we must have in the framework, in the text of this Withdrawal Agreement, we must have an operational solution for Ireland." He added: "The Irish question is not about goods, or customs or technical matters, it is about people… There is huge and very emotional sensitivity on these issues. The key proof that Brexit has no added value is on the island (of Ireland)."